These Dewalt Nickle boots are Ideal for use outdoors, the DeWalt Nickel Safety Hiker Boot is both waterproof and breathable, making it the ideal choice of boot for both hot conditions and also wet environments. 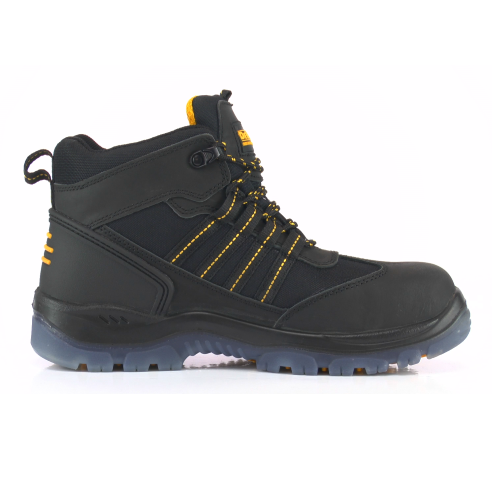 Manufactured from a hard wearing leather and mesh combination, these boots are both comfortable and protective, featuring steel toe and midsole protection, TPU outsole and heel support for stability on tough terrain. Please note that at Safetyboots UK we pride ourselves on our knowledge in the safety footwear market, as such if you are looking for waterproof safety footwear it has to be GORE-TEX lined anything else may not live up to your expectations only GORE will, we can say this with many years experience in the Safety footwear market. Water repellent, water resistant, or even waterproof means nothing unless its got a lining.